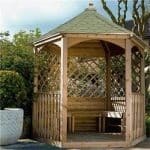 This particular 4 sided Gazebo has many different functions, not only does it add some real drama to your garden or outdoor space but it makes for a wonderful place to dine in during the warmer months, entertain friends in for drinks or just relaxing with the family in the sunshine. 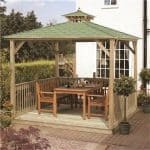 It is manufactured from pressure treated timber with tongue & groove cladding giving it extra strength and durability and it has a felt shingle roof. 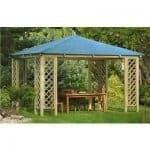 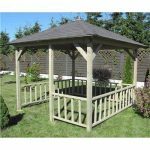 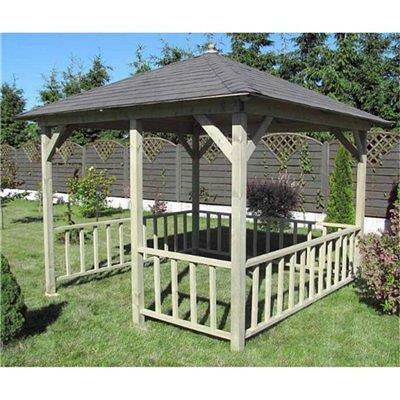 A fantastic all-round Gazebo which will give you years of pleasure and use. 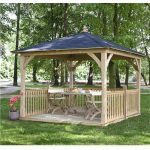 You might also like to see the top 5 10×10 gazebo currently on sale in the UK by visiting the WhatShed 10×10 gazebo awards league table.